Boy in Veterinarian's Office, a Norman Rockwell painting, appeared on the cover of The Saturday Evening Post published March 29, 1952. This is yet another timeless favorite of Rockwell collectors, a classic for all the ages. This painting was Rockwell's 271st overall out of 322 total paintings that were published on the cover of the Saturday Evening Post. Rockwell's career with the Post spanned 47 years, from his first cover illustration, Boy With Baby Carriage in 1916 to his last, Portrait of John F. Kennedy, in 1963. This was also the second cover for The Post in 1952. In 1952, there were five Norman Rockwell Saturday Evening Post covers published. The original oil on panel painting, 18 x 16 inches or 47.5 x 40.5 cm, is part of a private collection. on page 190 of Norman Rockwell, A Definitive Catalogue by Laurie Norton Moffatt. Pristine original copies of this magazine cover sell for big bucks on eBay, when it is offered. And to think it only cost fifteen cents originally! And it was mint condition then, too. In this painting, Norman Rockwell shows us a twist on a favorite theme of his, the trip to the doctor's office. At the center of attention as well as the center of the painting is a little boy with his sick dog. We cannot know exactly what is wrong with the dog, but it looks like the boy thinks he has the mumps. He has wrapped the dogs head with some fabric just like mothers used to do when their children contracted the mumps. Apparently all the other dog owners in the waiting room believe his diagnosis. No other dog or owner is anywhere near the boy and his dog. The vet, looking through the cracked door to the waiting room, has an amused expression on his face. Maybe he knows about the boy's diagnosis. None of the other four dogs have a sling on their heads. None of the other dogs is approaching the little mumps-infected dog. To be fair, the little dog really does look like he doesn't feel well. The other people in the waiting room show us a study in period clothing. All three ladies are wearing different styles of hats. 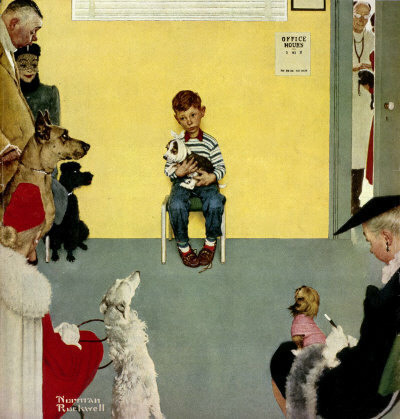 Boy in Veterinarian's Office was only one of 322 Norman Rockwell Saturday Evening Post covers; Here is the list of Norman Rockwell Saturday Evening Post cover illustrations. The lady at the bottom right has a fur piece draped across her lap. And the lady at the bottom left apparently has a fur collar on her cape. This, of course, would be frowned upon nowadays, especially by animal lovers such as you would find at the vet's office. The man with the big dog on the left side of the painting actually looks like he feels worse than his dog. Maybe he is on his way to his doctor after the veterinarian's office. Do You Have A Great Story, Opinion Or Contribution About Boy in Veterinarian's Office?